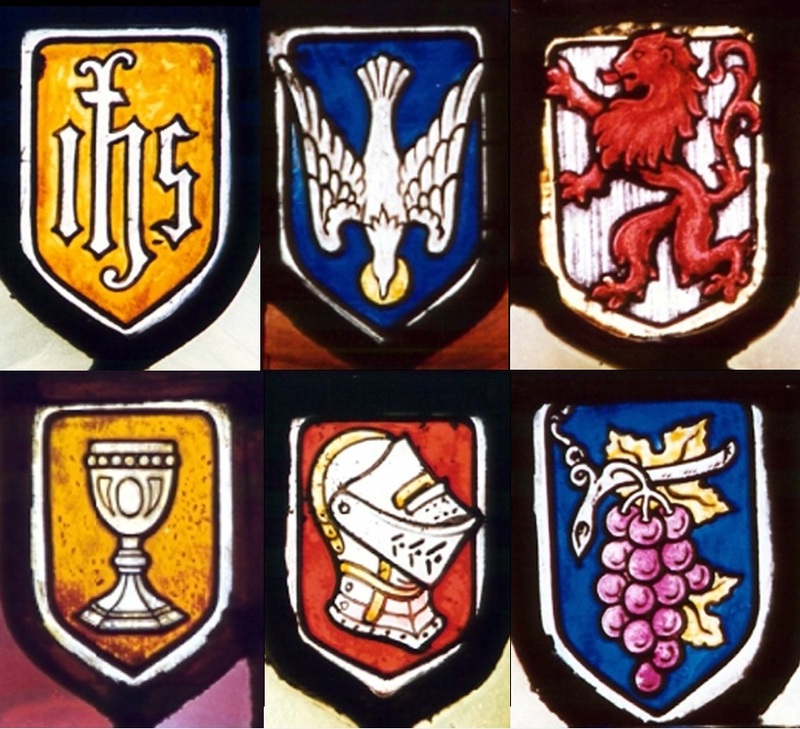 The Church throughout the ages has not only supported, but commissioned the arts. 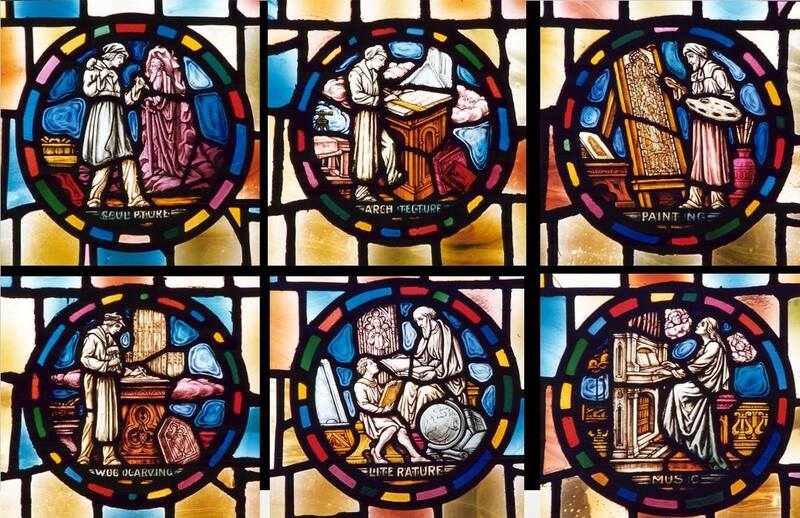 The windows in HT’s Luther Lounge, created in 1932 by Detroit Stained Glass Works, celebrate the creative contributions of God’s people throughout the world. The Holy Trinity Slovak Lutheran Church of Detroit, located at 4150 Oliver, was closed in 1995. The medallion window, located above the altar in the chancel, was removed and brought to Historic Trinity, when the two parishes merged. Crown: Christ the King of kings and the crown of eternal life. Christ is the king of our souls for he has gone to Heaven to be ruler over all things. Candelabra (seven branches): the seven branched candelabra is a symbol of Old Testament worship. Known as the “Menorah”, this type of candelabra is still used in Jewish synagogues today. Saw and Pliers Saltier: the second symbol in this window may not be instantly recognized, but like the first, is one that should cause joy to swell within our hearts. Throne with Fleur-de-Lis: the throne of judgement is here symbolized with the fleur-de-lis emblazoned upon it. For some, the thought of God the Father sitting on the throne of judgement with his Son, our blessed Savior sitting at his right hand, can be a terrifying scene. Cross of Thorns and Nails: the crown of thorns represents the crown placed on Lord’s head when Pilate declared him to be “the King of the Jews”. The nails symbolize the nails used to secure our Lord to the cross. The combined symbols depict the crucifixion. 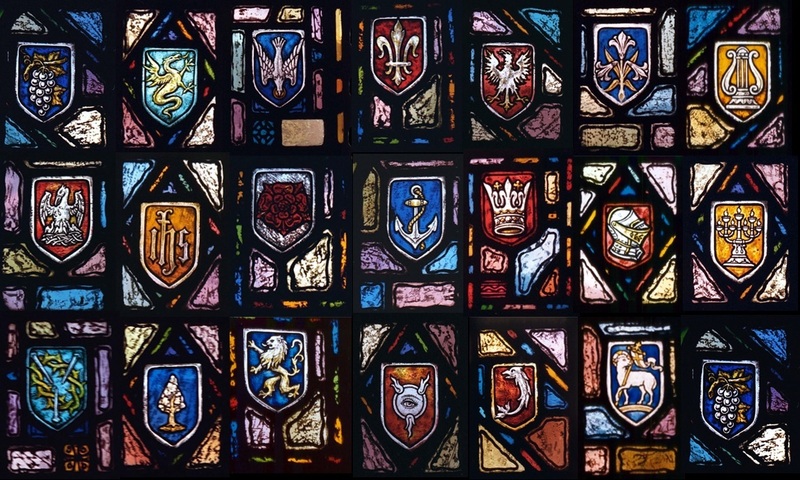 The Dau Church History Library, located on the third floor of Otte Hall, contains a sections of the stained glass windows from the former Holy Trinity Polish Lutheran Church Chancel. The original windows were eight feet wide and were made in the early 1900’s. Grapes: a bunch of grapes signifies the sacrament of Holy Communion and is most appropriately found about the communion table. The grapes and vine also represent the church. Dragon: the dragon is a symbol of Satan, or a symbol of sin. 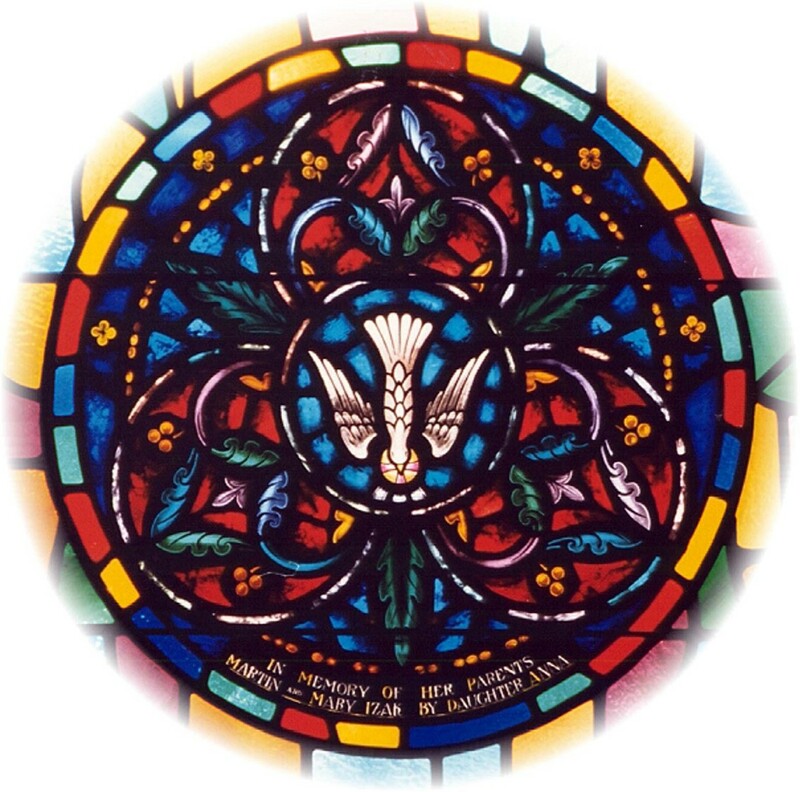 Dove: the most usual symbol of the Holy Spirit is the descending dove, usually with a three-raged nimbus around its head. Fleur-De-Lis: this is a symbol of the annunciation of our Lord, likewise of his human nature, and the Virgin Mary. It was selected by the French kings as their symbol and later was used in the banner of Joan of Arc. Eagle: the eagle flies high over the world, higher than all the birds. It demonstrates the majesty of Christ. Easter Lily: the sweet white Candidum Lily (Easter Lily), found wild in what is now Palestine, Asia Minor, and Syria, was cherished for its food and medicinal value by ancient nomadic tribes of the Near East. Lyre: the lyre is used most frequently as the emblem of praise. Pelican and Young: symbol of atonement. The pelican was believed to draw blood from its own breast to feed its young. IHS: IHS or IHC is an abbreviation of the Greek word IXTHUS, meaning Jesus. Messianic Rose: the Messianic rose is a favorite Christian symbol for the promise Messiah. The prophet Isaiah stated that the desert shall bloom as the rose at the coming of the kingdom of righteousness. Anchor: one of the oldest of all symbols of our Savior is the anchor; it originated in the days of the catacombs. Crown: the crown denotes our Lord’s kingly office, and also expresses the fact that we have eternal life through him as well. Candelabra: the seven candle candelabra was used in the Old Testament tabernacle for generations as a symbol of light. In the New Testament, it symbolizes Christ is the light. Crowns of Thorns and Nails: the crown of thorns represents the crown placed on our Lord’s head when Pilate declared him to be “The King of the Jews”. The nails symbolize the nails used to secure our Lord to the cross. The combined symbol depicts the crucifixion. Olive Tree: the olive tree symbolizes the tree in the Garden of Gethsemane under which Christ knelt and prayed “Father, if it be possible, remove this cup from me“. Fish: the Greek word for fish is IXTHUS, each letter was regarded as a word, making up the symbol – Jesus Christ, Son of God, Savior. In the days when it was dangerous to be a Christian, the followers of Jesus resorted to secret signs and symbols to prevent from exposing themselves to the foes of Christianity. Lamb and Banner: out of the Hebrew sacrificial system, Christian application is made of the lamb as the symbol Jesus Christ. Sometimes the lamb carries a resurrection banner, representing the risen lamb of God is triumphant. Grape: a bunch of grapes signifies the sacrament of Holy Communion, and is most appropriately found about the Communion table. The grapes and vine also represent the church. Torch and Wreath: the torch, as a Christian symbol, signifies witnessing for Christ – “Let your light shine.” The torch, together with a wreath of victory, symbolizes our witness is about the victorious crown of life. Fleur-de-Lis: this is a symbol of the Annunciation of Our Lord, likewise of his human nature, and of the Virgin Mary. 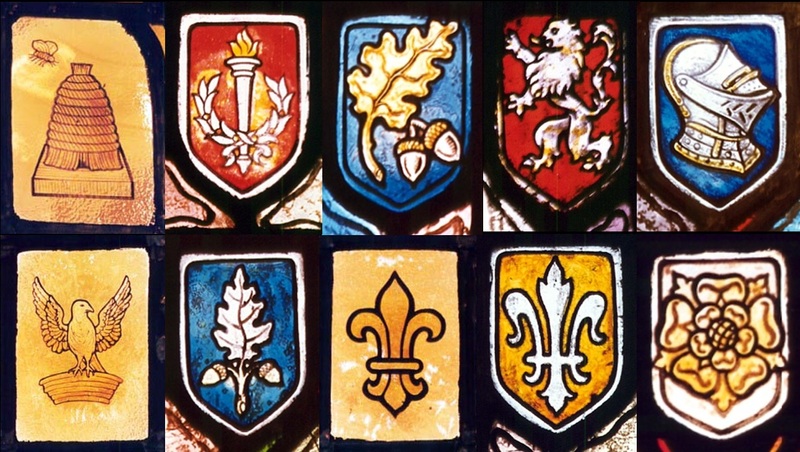 It was selected by French kings as their symbol and later was used in the banner of Joan of Arc. Messianic Rose: the Messianic Rose is a favorite Christian symbol for the promised Messiah. The prophet Isaiah stated that the desert shall bloom as the rose at the coming of the kingdom of righteousness. Chalice: the chalice is the symbol for the Sacrament of the Altar, representing the actual cup used by Jesus at the institution of the Lord’s Supper. A chalice by itself is a symbol of faith and worship. Lamb, Book, Seals: out of Hebrew sacrificial system, Christian application is made of the sacrificial lamb as the symbol of Jesus Christ. John the Baptist said of him, “Behold the Lamb of God, that takes away the sin of the world.” Thus, the Agnus Dei is a very common symbol for the Son of God. Christ became the sacrificial lamb all the time. The Lamb of God may be seen lying upon the Book of Seven Seals of the book of Revelation. Sword: and Aramaic the sword symbolizes power, justice, authority, martyrdom, warfare, and fortitude. Cross on Three Steps: the three step cross in called the Graded Cross. The three steps, from the top down, stand for faith, hope and charity. Father Eye and Triangle: a symbol for God the Father is the all seeing eye, usually pictured within a triangle with three rays protruding from the eye. Both the triangle and the rays depict the Trinity. The all seeing eye is a symbol of the Father’s omniscience. Helmet and the Breastplate: the helmet and breastplate symbolize the “helmet of Salvation and Breastplate of Righteousness“. The Altar of Sacrifice: the altar of sacrifice refers to the Old Testament sacrifice of ritually offering up animals as burnt offerings as written in the book of Leviticus. Harp – the harp stands for the joyful worship and for the angels’ joy in heaven. The Ark of the Covenant: the Ark of the Covenant symbolizes both Old Testament worship and the presence of God. The ark becomes a symbol for the Savior who became our prophet, priest, and king. 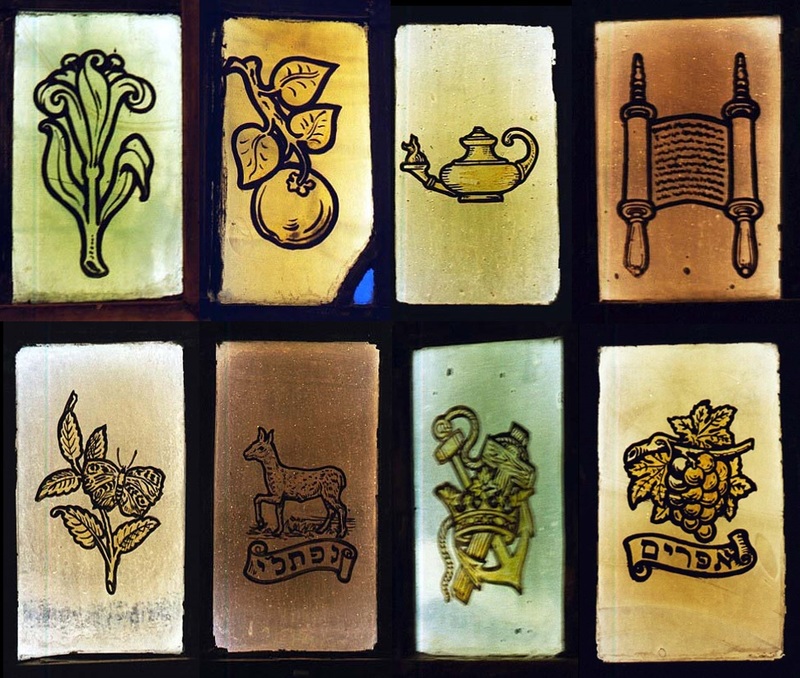 The window in the pastor’s study were made by the Detroit Glass Company, located on West Fort Street. 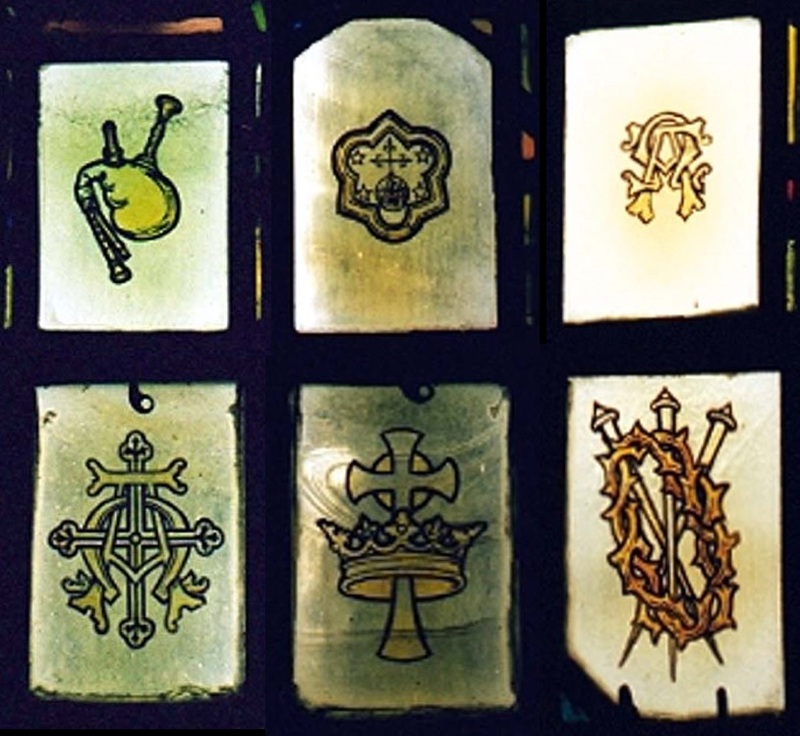 They are made of English Norman slab glass, of various thickness and weight. They contain medallions showing the passing of the Word from Age to Youth. Age: an older person’s graying hand is passing on the torch of life and faith to youth – the next generation. Bible: the open Bible with the words “In the beginning God created the heavens and the earth – then God said let there be light” symbolizes the central message of the Bible that is passed from age to youth. Bible: the symbol of the bible and the lamp depict the gift of the bible as the Light to the world. Chalice: the chalice is also a reminder of the great sacrifice which Christ made on our behalf. Two Crossing Fish: this is a very interesting and unusual symbol pictured in this out-of-the-way location. The symbol recalls St. Andrew’s original occupation that of being a fisherman, thus being represented by the first fish. 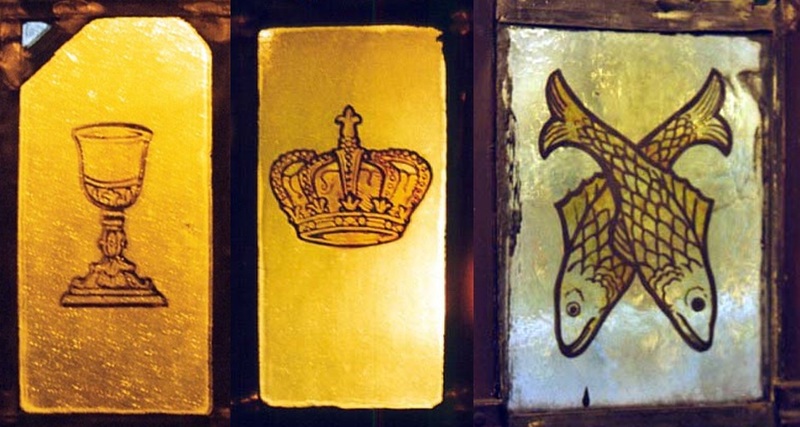 The second fish represents his call by Christ to become a fisher of man, as an Apostle. Lily: the lily, mentioned earlier in connection with several other windows, is a very popular symbol for the Resurrection of our Savior Jesus Christ. Scroll: the scroll is a symbol of the Old Testament: the Law and the Prophets. Just as Christ is the center of our faith, so Christ was the center of the faith of the believers in the Old Testament. Butterfly and Olive Branch: the butterfly is a symbol of the resurrection. The olive branch is a symbol for peace, harmony, and healing. Lamb: the spotless Lamb, or Lamb, without blemish, was the animal commanded by God to be sacrificed at the time of the Passover. The Cross, Crown and Anchor: Jesus Christ (the Cross) is our sure hope (the anchor) or the anchor of our faith, keeping us grounded in such faith as gives us the victory (crown), the crown of eternal life. Bunch of Grapes: a bunch of grapes can have several different meanings is church symbolism. In our current example, however, the Hebrew word below it is the work for “Ephraim”. At this time Joseph was in Egypt. After having been enslaved, he had been made ruler over Egypt because of his ability to interpret Pharaoh’s dreams.